When I first went to the United States I was afraid that I would only eat junk food but it was not the case. Luckily I found the wagon, and during our twelve days in Miami my father and I went there many times. 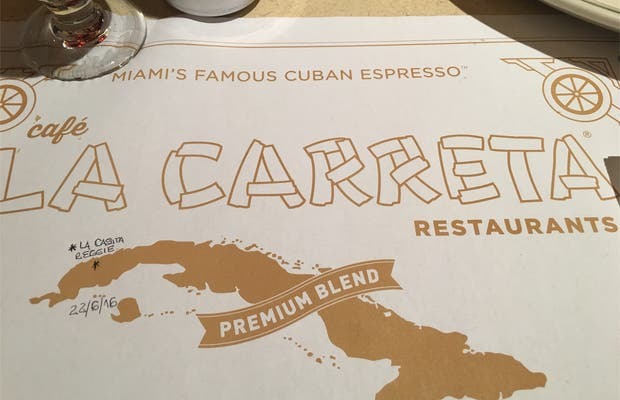 It is undeniable that Miami is Cuba and therefore could say gastronomically too. The first visit was to the one on Bird RD (Calle 40 and Avenida 86). Sandwiches, delicious milkshakes ... After spending a day at the airport It was great. Coffee is one of the best things at La Carreta, I love Cuban coffee. Afterwards, we went there for lunch a few days ate for $ 15 with drink and tip. One thing that surprised me is that when you order something they bring A DISH (a nice dish) and two dessert plates with the two Conduits (cassava, potato chips, etc ...) They also deliver.